Firecrackers, fierce warriors, sliced-up faces. 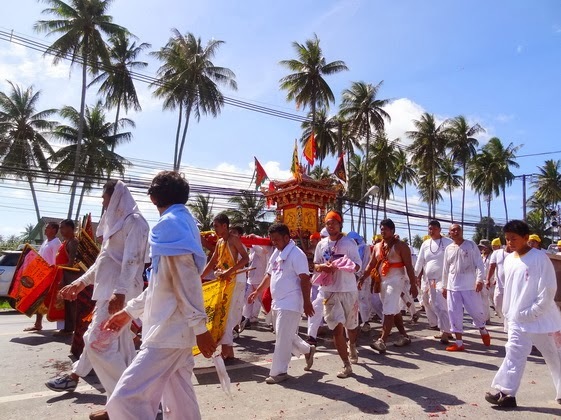 The Phuket Vegetarian Festival, one of Thailand’s most photographed events, has just come to a close. Amid the acrid smoke and unsettling scenes of the eye-rolling, self-mutilating processions of the possessed it’s difficult for an outsider to comprehend that these acts are all in the name of purification and renewal. People who take part in the festival perform various roles but none are as famous as the ma song. These are the men and women – mostly men – whose bizarre facial piercings and daring acts are captured by videos and photos for the incredulity and amazement of readers around the world. The ma song’s bodies are said to be possessed by the Emperor Gods of Chinese Taoist faith, and in doing so become a sort of receptacle that absorbs the bad luck and evils of the community to bring about better fortunes. 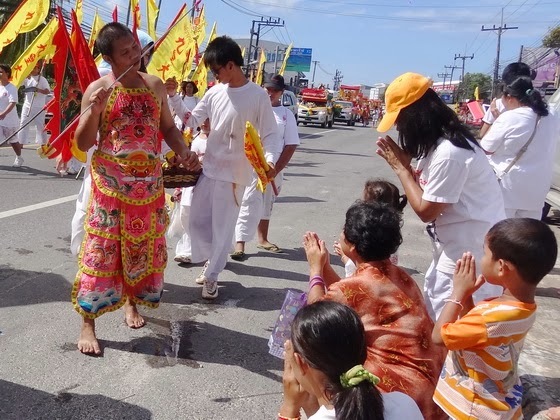 There are certainly many people in Phuket – Thailand’s richest province – who believe that this annual cleansing has given the island a sort of celestial boost that has protected it time after time. Parade-goers show respect to the ma song warrior. How does one become a ma song? According to the official festival website, some ma song take on the role willingly as a way to revive and extend their lives. Others are chosen by the Gods for their “moral qualities” – they have no say in the matter. Indeed, I remember editing an interview with a long-time ma song years ago, who said he’d become one at a young age. 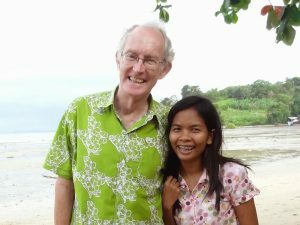 One year he decided he’d had enough and stayed away from the festival, going instead to see a movie with a girlfriend. He didn’t remember what happened but when he next became conscious he found he was at one of the Chinese temples, coming out of a trance. His girlfriend later told him he’d suddenly stood up and dashed out of the theatre in the middle of the film. A chosen one. As an outside observer watching the dizzying clamour, I try to peer into the faces of some of the people passing by, especially those in a state of enchantment. Their faces swing side-to-side, their eyes roll back, and many are muttering under their breath. Those with horrific holes through the cheeks, jabbed through with any number of implements from knives to pistols to thorny rose stalks to petrol pump nozzles, seem to take their pain with utter stoicism. Some say they feel no pain at all. I’ve seen many such faces over the years and I still can’t fathom what any of the souls behind them are thinking, experiencing. At one of the parades this year, I stood at the roadside, taking photos of the procession makers and those lining the road to watch them. Ma song are said to feel no pain from the piercings. I saw a young ma song approaching, walking along with a few helpers at his side. This one had no piercings, but he was clearly in a trance. Only the whites of his eyes were visible. When he got close enough I lifted my camera and as I did so his eyes suddenly flicked down and focused on me. I was so startled by this look, which lasted only a few seconds, that I put the camera down and didn’t take his picture. The skeptic in me says that of course these trances are put on for show. That quick look, drawn out by the presence of a camera, was merely a flickering loss of concentration in keeping up the trancelike state. Or could it be that an ancient god was trying to communicate something through his human incarnation? I’d like to think so, but I can’t. My resistance to turning the mystifying and the unknown over to Gods of any form is too strong, too entrenched. But for those who embrace the mysterious and plunge in to elaborate, sometimes frightening rituals with fervour, sacrifice and total abandon, I feel privileged to have a front-row seat to watch it all unfold. 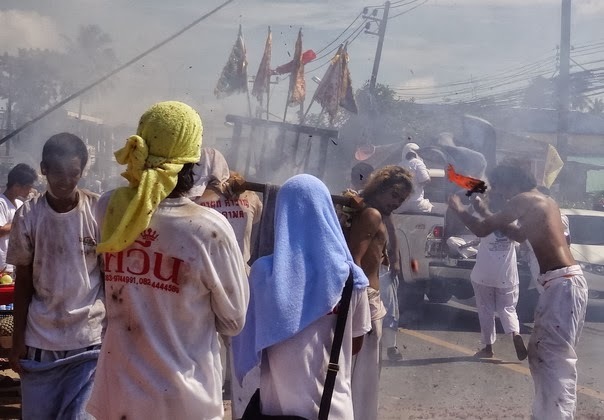 In confronting the extremes of faith and physical torment, there are few spectacles that match the Phuket Vegetarian Festival. Too pretty to pierce? Veg Fest flair on full display. Trance at the Phuket Vegetarian Festival – an incredible video of possessed ma song by Bertrand Linet. 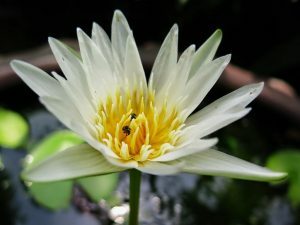 Phuket blogger extraordinaire Jamie Monk has captured hundreds of compelling images over the years, particularly in these two posts: My favourite event in Phuket and the Amazing Phuket Vegetarian Festival. And he has a new set of photos for 2013 Veg Fest on his Flickr page. Photographer Michael LaPalme has a series of shocking images on his Vegetarian Festival post. 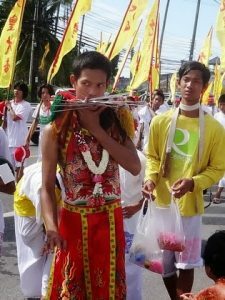 Phuket 101, run by the talented Willy Thuan, has a great set of images on his Phuket Vegetarian Festival post, which he updates every year. Good one to check for a schedule of events. For some history and background of the event, check this Thaiways Magazine article and the official Phuket Vegetarian Festival website. Festival participants wear white and refrain from eating meat.